The Moosehead region of Maine is an area of unprecedented beauty. The remote mountain peaks, extensive forests, pristine waters, clean air, native fisheries, and diverse wildlife make this region an extraordinary place of wildness. In spite of the destructive logging which has scarred the landscape with clearcuts and logging roads over the last several decades, one can still feel the sense of being on the edge of the last frontier, which extends northward to the wilds of the Allagash, eastward to the Katahdin wilderness, and westward to the Canadian border and the famed Moose River region. Moosehead represents the heart of the last remaining unprotected wildlands in the east. FEN director Jonathan Carter in a Plum Creek clearcut north of Flagstaff Lake. Photo by Janet LeClair. While the damage from the abusive logging can be healed over time, Plum Creeks massive wilderness sprawl proposal which includes some 975 lots and a resort/development on Lily Bay, if allowed to proceed, will forever alter the wild character of this one of a kind gem. Their sprawling intrusive proposal will set the stage for further encroachment. While Plum Creek would like us to believe their proposal balances conservation with development, nothing could be further from the truth. Plum Creeks plan is all about bottom line profits. Getting the re-zoning required for their 10,000 acres of developments will increase the land values which will result in a Wall Street bonanza. Plum Creek paid about two million dollars for these 10,000 acres six years ago. If their development scheme moves forward, they stand to make hundreds of millions With these sorts of potential profits at stake, the next proposal for further development into this last wild Maine frontier will certainly follow. We must stop them now or the flood gates will be opened. The Forest Ecology Network and RESTORE:The North Woods have advocated for over a decade for the protection and restoration of this region. We have recognized its significance as a national treasure. We have supported the vision that this region become the next great National Park. We were not the first. Indeed Thoreau, after his travels through the area in 1853, recommended that this wild region become a national preserve. Thoreau understood the importance of what he called primeval, untamed, and forever untameable Nature. Our vision is for protecting for future generations the legacy of the wild Maine Woods where nature can operate unexploited by human consumptive uses and where solitude, spiritual renewal, and a connection to nature can be found forever. The Moosehead region is a crown jewel. We have no other choice, but to defend it against Plum Creeks unprecedented attack. Failure is not option. The SAVE MOOSEHEAD CAMPAIGN will focus on building a strong grassroots effort. In the coming months, as Plum Creek pushes for approval for its sprawl proposal from LURC, we must be out in force opposing them every step of the way. We were successful in building public opinion against their first proposal. We once again need to build public sentiment against their new plan, which is just as damaging, but has been re-packaged so that it is more saleable to the public. We have a difficult task ahead. The wily ways of this corporation, which in years past was labeled as the Darth Vader of the forests, should not be underestimated. Plum Creek has put together a team of dark side paid lobbyists and media consultants who are experts in deluding people. They have already launched a tv ad campaign and are advertising on Maine Public Radio, portraying themselves as good stewards of the land. This year will be the showdown on deciding how the future of the last of wild Maine will be charted. We are at a crossroads. Plum Creeks path leads to unmitigated destruction and development. Our compass direction will lead us to the restoration of wilderness and the permanent protection of the legendary and the extraordinary Maine Woods. 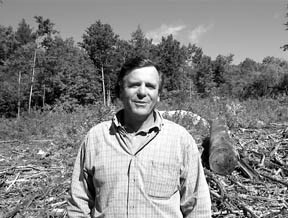 Jonathan Carter is the director of the Forest Ecology Network, a Maine nonprofit conservation organization. This article was originally published in the Fall 2006 edition of The Maine Woods, a publication of the Forest Ecology Network.